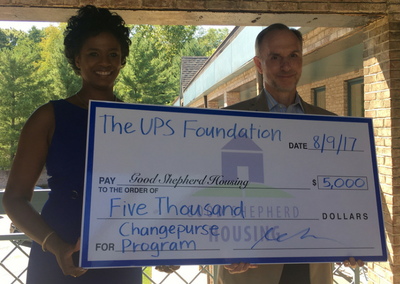 Good Shepherd Housing and Family Services, Inc. (GSH) received a $5,000 grant from The UPS Foundation, which drives global corporate citizenship and philanthropic programs for UPS (NYSE: UPS). The grant will be used toward encouraging GSH clients to save money during their participation in a new financial mentoring program called Changepurse. This fall, Good Shepherd Housing and Family Services, Inc. (GSH) will be kicking off a new financial empowerment program for its clients. The Changepurse program is a tailored financial mentoring program where participants will meet with trained volunteers for one hour each week for eight weeks to discuss attitudes about money and money management skills. As part of the program, participants will be encouraged to save between $25 and $500 over the eight weeks. Thanks to this grant from The UPS Foundation, GSH will be able to match each participant’s savings during the program, up to $500. In 2016, UPS and its employees, active and retired, invested more than $116.6 million in charitable giving around the world. The UPS Foundation can be found on the web at UPS.com/foundation. To get UPS news direct, visit pressroom.ups.com/RSS.